For this course the students will need to have a basic knowledge of Portuguese (Pt) language (which includes basic vocabulary and grammar). Portuguese: Spoken by 210 million people, the seventh most widely spoken language, official in eight countries. - Spoken by 210 million people, Portuguese is the seventh most widely spoken language in the World. - Portuguese is the official language of eight countries: Angola, Brazil, Cape Verde, Guinea-Bissau, Mozambique, Portugal, São Tomé and Príncipe and Timor-Leste, and an unofficial language in numerous linguistic islands in China (Macau) and India. - There are 1.3 million native speakers of Portuguese living in the United States. - Since it is so important and so rarely studied, knowledge of Portuguese is a very marketable skill, especially in commerce and banking. - The richness of Literature in Portuguese is astonishing: from The Lusiads - the great epic poem of the European Renaissance, to the modern Brazilian novel - the best-kept secret in the Western Hemisphere. - Brazil is the eighth largest economy in the World and features the Amazon jungle, enormous urban cities such as Rio de Janeiro and São Paulo, and 6,000 miles of beaches. Reading and comprehension of Portuguese Literature texts and articles. 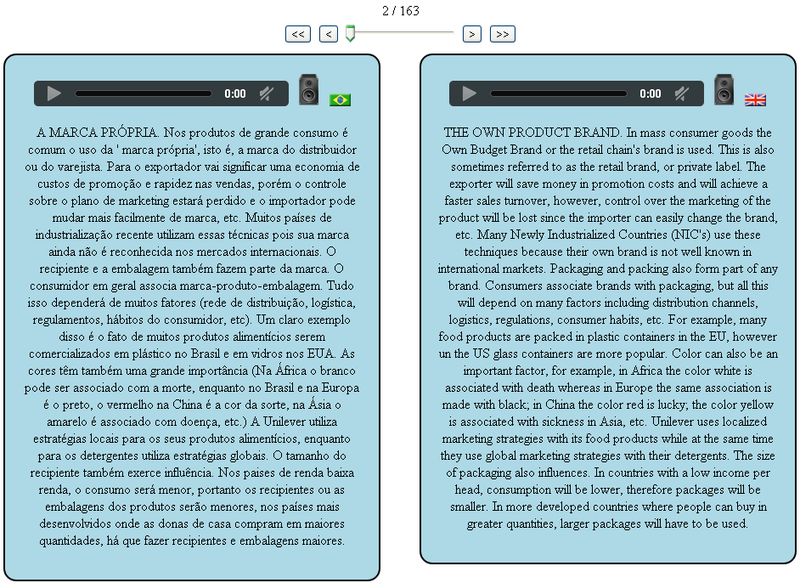 - Cases of conversations I: International Business: 100 bilingual conversations in Portuguese and English. - Cases of conversations II (with audios): International Marketing. 170 bilingual conversations in Portuguese and English. At the end of the course, students will be able to translate texts with the help of the dictionary.